Every so often a book comes along that makes me want to turn right back to the introduction and start reading it all over again. 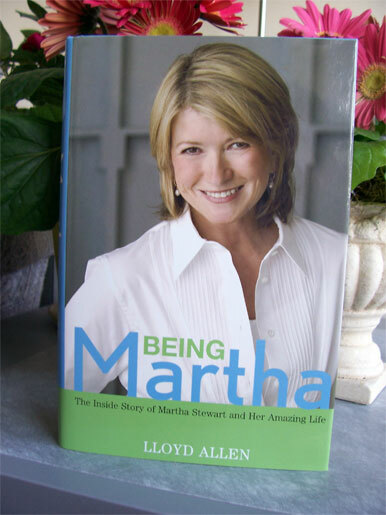 “Being Martha” by Lloyd Allen is one such book. An inside look at the life and times of Martha Stewart, Being Martha is told from the perspective of a friend and former neighbour of the woman the world has come to know simply as Martha. (There really is only one!) Author Lloyd Allen knows Martha personally and has watched her ventures grow from a basement catering operation to one of the most successful and unlikely American enterprises ever built. The book is filled with personal accounts of Martha’s formative years as a caterer in Westport, Connecticut, as well as exclusive interviews with family members, including Martha’s daughter, Alexis, her mother, Martha Kostyra, her brother George and her sister Laura. The book emerged as a kind of antidote to all the negative portrayals of Martha that were growing like strangling ragweed in the press during the investigation into her now-infamous stock sale, subsequent trial and jail sentence. “This book gives a fuller portrait than we have seen before of a complicated and fascinating woman. My hope is that by reading this more complete view of Martha you will have a better understanding of who and why she is,” Lloyd writes in his introduction. And his hope is fulfilled. Not only does the reader come to understand the “who” and the “why” of all that encompasses the great Martha Stewart, we understand, too, what it is to live life to the fullest – with the fullest vision, the fullest desire, the fullest appreciation of all that is alive and green and good. The stories and anecdotes in Being Martha span a breadth of history, most of it undulating in the kitchens of Turkey Hill – Martha’s now-famous home in Westport where her ventures originally began. There is a chapter about the author’s visit with Martha at the Alderson prison and still others about her growing empire: stories from her television studios are especially revealing. What we see through Lloyd’s eyes is a woman who is driven by a passion for life and energy to create. We see a woman who is compelled to live as fully and artfully as possible and come to understand why she is this way. We get an understanding of her childhood life with tales from her mother. We see what she is like as a mom through Alexis’s comments. We also see a woman on a mission. We see a woman who is impatient and temperamental but always forgiving in the end. We see a woman who draws people to her through a magnetism rarely seen in the annals of human history and who harnesses the energies of those people with sheer inspiration and, perhaps, a few commands! And we see a woman with regrets, with some degree of sadness for what she lost on her climb to the top and with an ability to cry and be reflective in private moments. She is not a woman of steel. 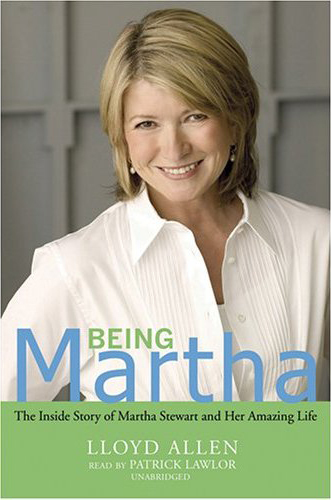 Reading “Being Martha” will inspire you. It is about Martha Stewart, yes, but it is also about life and the process of living. It is about human nature, too. Once I had finished it, I got in touch with Lloyd to tell him what I thought of the book and he agreed to answer a few questions for me about Martha and some of his recent activities in promoting the book. 1. Describe your recent visit to Alderson! In detail! Even though it is a 10 hour drive, I decided to drive to Alderson, West Virginia to give 2 lectures and do a book signing. Thoughts of the beauty of early spring flowering trees and shrubs and the landscape of the Shenandoah Valley convinced me that taking a plane was a no-no. I was there at the behest of John and Betty Alderson. It was the Alderson Store's 120th Anniversary and Betty invited me to "come on down" and stay for a few days and involve myself in various events. There is nothing like Southern hospitality. It was my birthday and I left early on April 6th, arriving at 4:30 in the afternoon. I knew the house I would be staying in because when I visited Martha during her stay at Alderson Federal Prison, Betty had offered up one of the family homes. No sooner had I pulled into the driveway, than Betty and John were parked behind me. I brought my bags in, I washed my face and we were off! I was given a tour of the town and then we went to their house where I met Mary, one of 2 daughters. After some wine and cheese, I found myself back in the front seat of the car heading into the countryside. Remember, I'm in the Appalachian Mountains on positively the most winding road I have ever been on with the most idyllic scenery passing me by. We arrive shortly at a wonderful 2-story red brick home to pick up a friend of the family, who just happened to be the 2nd warden of the prison. She was 90 years old but sharp as a tack. We were then off to dinner. The warden entertained me the whole evening with stories of way back when. When she had been the warden the famous prisoners included Billie Holiday, Tokyo Rose, Axis Sally and the wife and daughter of Machine Gun Kelly. Her stories were non-stop. When the discussion turned to Martha she asked me, "Lloyd, what did Martha think of Alderson?" I replied, "Well, the women and Martha didn't like the warden." Everyone got a big laugh, and this is no reflection on the woman that I was sitting across the table from. Our banter about Martha continued, but being that this was a small town and everyone knew everyone, well, I was introduced to the lady whose husband was charged with the responsibility of shining the light in the prisoners’ faces every night to make sure they were in bed. She said to me, "Martha hated that!" So this was the beginning of my 3 days in Alderson. The following day I gave a "Martha Lecture" inside the prison to a women's community group followed by lunch and then a book signing back at the Alderson Store. Betty had a brand new T-Shirt she was selling that said, "I spent time in Alderson." This was a follow-up to other classics such as, "West Virginia Living is a Good Thing" and "London, Paris, New York, Alderson." I am planning on giving Martha the new T-Shirt next week. I think she'll get a big laugh out of it. I'd like to see her wear it on her show. 2. What is your favorite "Martha Moment?" I have so many moments with her from long ago that touched me deeply but my favorite moment at this time in my life was my visit with her in prison. Now, understand I was 3/4 way into the book, I knew she would make a comeback and here I was going to see a woman I adored, a famous woman that millions adored, and I was going to visit her in prison. This is a story you tell your grandchildren! I wrote a whole chapter about my visit in Being Martha. Many have asked why I didn't interview others for the chapter, like fellow prisoners. I just wanted to write a chapter that described the event of the visit. Yes, I threw in a bit of background that I was aware of, from talking to family and Martha herself, but I think I got across a "Martha Moment" in the chapter. And this reminds me. My recent visit to Alderson assured me that the town has been changed forever. It will never get over the fact that Martha came and put the town on the map. The world knows Alderson and perhaps one day it will become the tourist attraction it once was back in the days when people visited the area for the healing sulfur springs. 3. Do you know if Martha has read the book and what she thinks of it? Martha has read the book. I have not discussed it with her. This is not Martha's way. I received the heads-up from various people that work for her. There were a few girls that worried what Martha might think about their remarks in the book. Everyone at MSO was nervous before it came out, but after reading it and seeing the book at Martha's home (I had one of her brothers-in-law hand deliver it to her), they all breathed a sigh or relief. 4. What do you consider to be Martha's greatest achievement? Martha's greatest achievement is a work in progress; you can't put a finger on it. She is a great female for all women to look to for inspiration. Her inner strength is unmatched and you will never meet a more focused individual. Martha has gone where no other woman has gone. She has opened the gate. She has conquered and taken no prisoners. She has legions of followers and a skilled army of artisans and business personnel that ensures her continued success. Martha is one of the brilliant minds of the 21 Century. If I had to pick her greatest achievement I would say that is the most apparent one: that Martha persisted with her message of home and the importance of domesticity. In the face of jokes, parodies and criticism she was undaunted and unwavering in her passion for life and to send that message to all that wanted to listen. Telling? I think it speaks volumes about Martha. Strewn about on the white flour-dusted counter top of her kitchen, even the Polaroid photos glimmered - insufficient super-glossy attestations of what was still to come. Nearby, a galvanized garbage can, the lid lifted and left leaning like a discarded female gladiator’s shield, played coliseum to the felled remains of the day’s Photographic Gastronome Games, a veritable PGG tournament if you will. All this living matter, tragically wasting and in the process becoming slowly immortalized (so to speak); this organic shrapnel held the only real clues to understanding Martha, her past and future, but to try and “put all the pieces back together again,” was a greater scientific challenge than dealing with poor old Humpty Dumpty’s predicament. So barring any unforeseen miracle or dark magic, these pieces of proof will lie like discarded mythic tales and unnoticed tea leaves and serve us little as we try to piece Martha's life back together again. Wow, such interesting stuff and how cool that you contacted him!